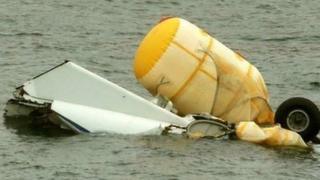 Image caption Thòisich a' chomataidh thaghte a' rannsachadh an dèidh tubaist anns an tàinig heileacoptair Super Puma a-nuas sa mhuir far chosta Shealtainn ann an 2013. Tha Riaghaltas na Rìoghachd Aonaichte air innse nach tèid làn rannasachadh poblach a dhèanamh air sàbhailteachd heileacoptairean a bhios a' siubhal a-mach dha na raointean ola. Tha seo an dèidh aithisg bho chomataidh thaghte na còmhdhail aig Westminster, a thuirt gu bheil fianais ann gu bheil cuideam coimearsalta a' cur sàbhailteachd an dàrna taobh. Thuirt Roinn na Còmhdhail ge-tà, nach fhaca iadsan fianais sam bith gu bheil teagamh ann mu shàbhailteachd agus nach cuireadh an Riaghaltas taic ri rannsachadh poblach. Thòisich a' chomataidh thaghte a' rannsachadh an dèidh tubaist anns an tàinig heileacoptair Super Puma a-nuas sa mhuir far chosta Shealtainn ann an 2013. Chaidh ceathrar luchd-siubhail a mharbhadh, anns a' cheathramh tubaist de a leithid ann an còig bliadhna. Dh'fhoillsich a' chomataidh aithisg as t-Samhradh, 's iad ag iarraidh gun deadh rannsachadh poblach a dhèanamh. Thuirt am BP Làbarach airson Obar Dheathain a Tuath, Frank Doran, gun robh an co-dhùnadh "na fhìor bhriseadh-dùil" dhasan. Thuirt Mgr Doran gun robh esan den bheachd gun robh "gnothaichean bunaiteach" ris nach deach dèiligeadh, riaghailtean a' ghnìomhachais nam measg. Bhon a thachair an tubaist ann an Sealltainn, thathas air diofar cheumanan a ghabhail gus piseach a thoirt air sàbhailteachd - mar eiseimpleir, inneal ùr a bhios a' cuideachadh an luchd-obrach ann a bhith a' gabhail anail fon uisge ann an suidheachaidhean èiginneach, ma 's e agus gun tuit heileacoptair dhan mhuir.